For many who are not familiar with the nursing profession, a nurse is a nurse; they may see nurses as just another class of healthcare worker. However, there is a hierarchy within the nursing profession just as there is in most other professions. Two of the most common classifications in that hierarchy are Registered Nurses (RNs) and Licensed Practical Nurses (LPNs). 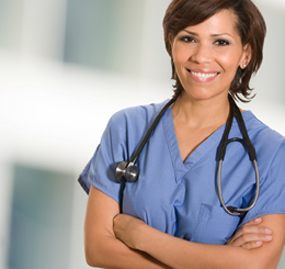 In some states, LPNs are called Licensed Vocational Nurses (LVNs). The differences between the two nursing classifications lie in many different areas, including scope of care and salary. RNs may work in a number of different settings ranging from clinics to hospice facilities. While RNs have a great deal of autonomy, they may still be expected to act on verbal and written orders from a physician. They are expected to assess patients and formulate a plan of care for them. That plan of care must be developed on an individual basis and will take into account their gender, dietary needs and the state of their health. Registered nurses will also be in charge of triage, which means that they will determine which patient’s care takes precedence based on an assessment of their symptoms. Registered nurses will have a minimum of two years training and an associate’s degree in nursing. LPNs can handle most of the same duties and work in the same settings as RNs, but without the independence. While the RN may assess the patient, it is up to the LPN to act on that assessment. Like an RN, an LPN may take orders from a physician in order to administer care to a patient; however, LPNs must always work under the supervision of RNs or a physician. The Practical Nursing Degree that must be earned in order to become an LPN takes about a year to complete. This means that an LPN can be trained and go on to treat patients in a considerably shorter length of time when compared to an RN. The main differences between RNs and LPNs lie in the area of responsibility. State licensing boards determine the level of responsibility. Some states have two licensing boards, one for RNs and one for LPNs; other states have one for both nursing classifications. The state licensing board will generally assign the more complex tasks to RNs. RNs get more training than LPNs, they complete more courses and therefore are trained to do more. With greater training comes increased responsibility, which means a higher salary. According to the Bureau of Labor Statistics, the median salary for RNs in 2010 was a little over $64,000. For LPNs, the median salary was just over $40,000. Just because there are differences in the roles and duties of each type of nurse, it does not mean that one type is more valuable than the other. The hierarchy within nursing exists to ensure that teams function effectively to provide patient care. All nurses work together to achieve the best possible quality of life for their patients, regardless of their classification. An individual who is attempting to choose between the two career paths should consider whether they want to work independently as well as how much time they want to spend in school.